Items found by police following a traffic stop in Marshall County and arrest of three Indianapolis men. MARSHALL COUNTY — Indiana State Police arrested three Indianapolis men for gun and marijuana charges following a traffic stop in Marshall County. ISP Trooper John Hart made a traffic stop at 9:45 a.m. Tuesday, Jan. 30, for a moving violation on a silver Chevrolet traveling southbound on US 31 near 13th Road. While Hart spoke to the driver, Deonta Larkins, 26, Indianapolis, he purportedly could smell the odor of marijuana. 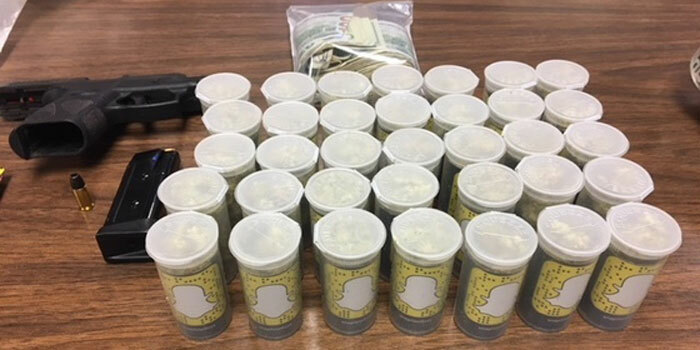 A search of the Chevrolet resulted in troopers finding 35 individual plastic containers containing suspected marijuana with a total weight of approximately 122 grams. Troopers also located a loaded handgun and more than $1,900 in cash. Larkins faces preliminary charges of driving while suspended-prior, class A misdemeanor; maintaining a common nuisance, and dealing marijuana, both level 6 felonies; and possession of a handgun without a permit, a class a misdemeanor. The front seat passenger, Donnell Hughley Jr., 21, Indianapolis, faces preliminary charges of maintaining a common nuisance and dealing marijuana, both level 6 felonies; and possession of a handgun without a permit, a class A misdemeanor. The back seat passenger, Dillon Lyons, 26, Indianapolis, faces preliminary charges of maintaining a common nuisance and dealing marijuana, both level 6 felonies; and possession of a handgun without a permit, a class A misdemeanor. All three men were taken to the Marshall County Jail. Assisting Hart was ISP Trooper Rodd Schuh, Sgt. Ryan Lebo and Marshall County Deputy Cullen Smith.